The debugger quit working, not quite sure what I've done wrong ? Earlier today I cleared all the breakpoints, and now I cannot set any breakpoints at all. When I try to debug, the browser displays the page, but the debugger does not stop on the first line. ERROR : Waiting for incoming connection with ide key '12089'. It appears that not having a valid connection is causing the breakpoint problem above. 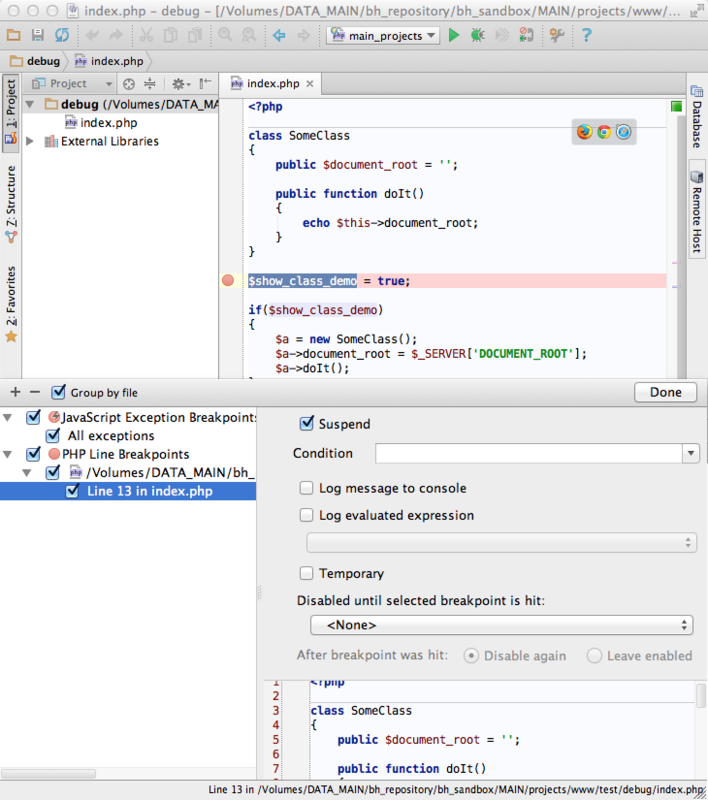 [ ] PHP Line Breakpoints (which I consider to be a category of breakpoints) is missing. 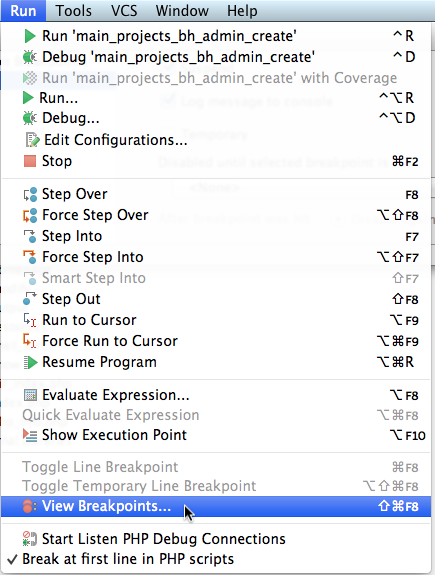 When I launched phpstorm on my MacBook Pro and go to "Run -> View Breakpoints", it contains the category of breakpoints that is missing on my workstation. Earlier in the day I selected the block of items inside the red box on image 046 below, and deleted/cleared all the breakpoints, and apparently once I did that the breakpoints are no longer working by clicking on any line in the editor. ( a ) Any ideas how to fix the missing "[ ] PHP Line Breakpoints" category ? ( b ) If you can't get this category back, it seems like you shouldn't be able to delete it ? I spent several hours going over the documentation, prior to posting the message, but was not able to find a solution. With such settings you do not have to use any Run/Debug Configurations, since xdebug will attempt to establish debug session for every single request. If you click "Debug" button (for entry of any type of Run/Debug Configuration for PHP), it will start listening for incoming debug connection with specific ide key (like "12089" in your case -- which is generated when you click on Debug button). Instead of that you should just use "Run | Start Listen PHP Debug Connections" (or the button with phone handle icon on main toolbar) -- it will listen and accept php debug connection with ANY ide key. 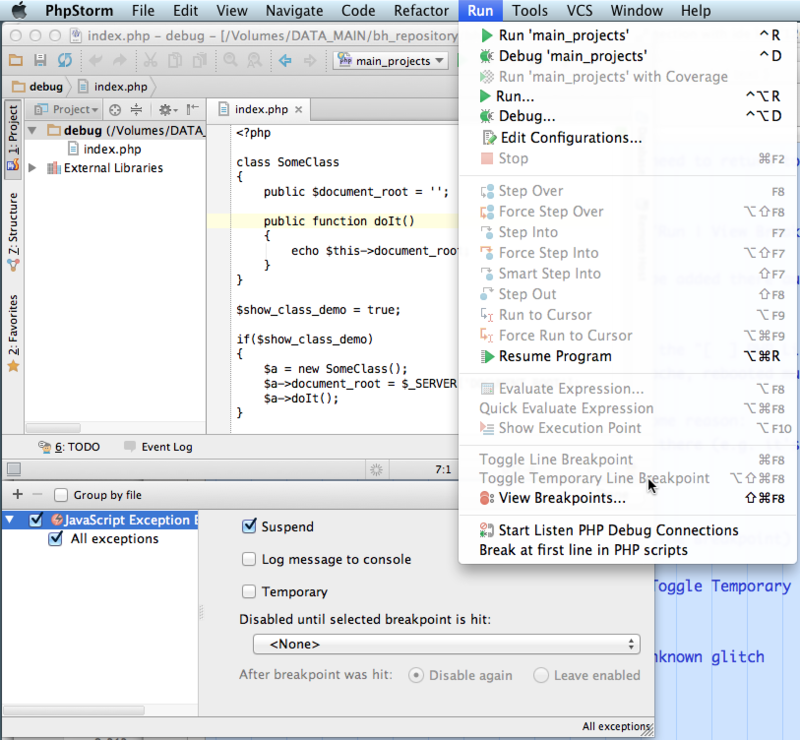 Yes, you cannot create new breakpoint for PHP in "Run | View Breakpoints" window. Try "File | Invalidate Caches" (in case IDE wrongly thinks that breakpoint cannot be set there) -- this universal recipe surprisingly helps in lots of IDE-side cases. ( 1 ) ===> Great Tip! ( 2 ) ===> Found the button, I will start using it. 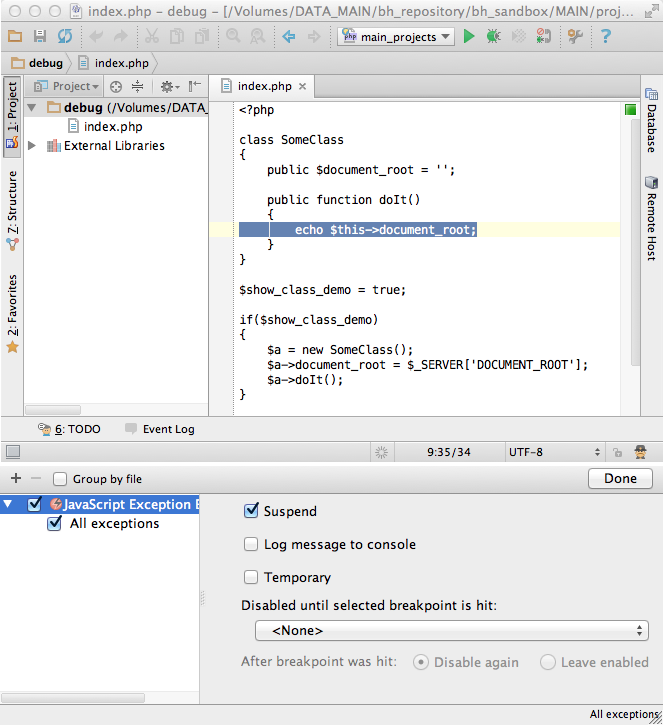 ( 4 ) ===> Every attempt that I have made to regenerate the "[ ] PHP Line Breakpoints" has failed. I've tried different items in php.ini section for xdebug, restarted apache, rebooted multiple times, all to no avail. ( 5 ) ===> They are valid lines, not comments, etc. ( 6 ) ===> "Run -> Toggle Line Breakpoint" and "Run -> Toggle Temporary Line Breakpoint" are both disabled, no matter what is selected. ( 7 ) ===> I've done that many times already. ( 8 ) ===> I've done that many times already. ( 9 ) ===> Tried this and re-launched the application, but that did not help. ( 10 ) ===> Brand new project called "debug" with images below. See ( 6 ) also. I think my only alternative will be to delete the preferences, to see if that causes "[ ] PHP Line Breakpoints" to be regenerated, if that doesn't do it, I will try to re-install. I am also wondering of I can export the settings for my workstation, and for my laptop, do a diff to see if the breakpoints from my laptop show up there. Then perhaps I can import the settings from the laptop into my iMac, any ideas ? Look at the file icon next to file name -- it has "Text file" icon, not PHP one. Plus -- it has no PHP syntax highlighting AT ALL! 1) If ALL files named "index.php" are like this -- make sure that there is no "index.php" (or very similar) pattern in "Settings | PHP | File Types | Text files". If it has -- remove it. 2) If it's like that for ALL PHP files -- the same place -- look for *.php pattern -- remove from there and add back to "PHP files"
1) If ALL files named "index.php" as like this -- make sure that there is no "index.php" (or very similar) pattern in "Settings | PHP | File Types | Text files". If it has -- remove it. ( 1 ) ===> Look at the two images, the "*.hphp" is obviously wrong, how I messed that up, I don't know ? ( 2 ) ===> I changed "*.hphp" to "*.php", applied the changes, and everything is working correctly. I would have never spotted the cause of the problem, I am very happy you did! 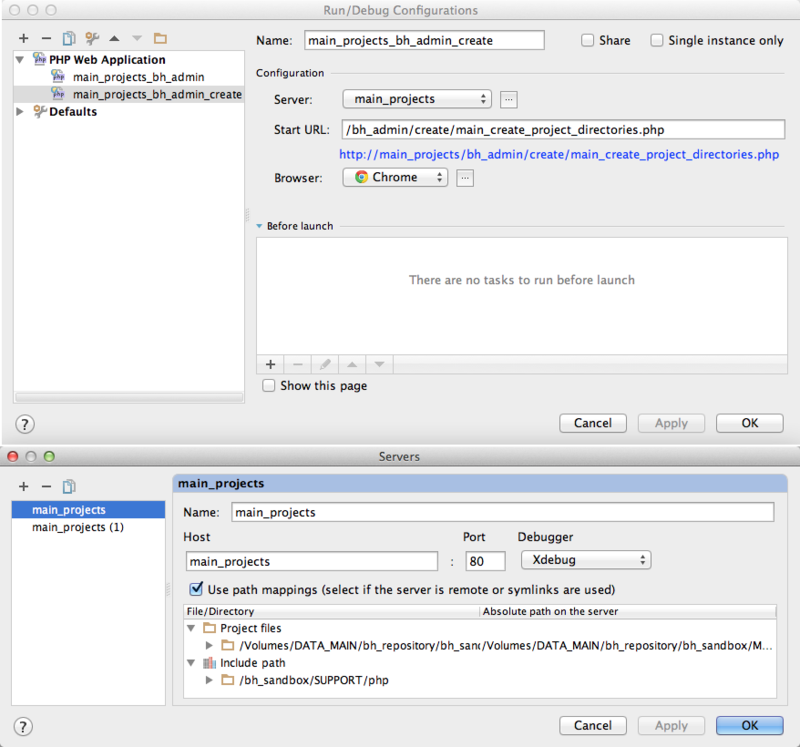 3) If nothing like that there (only that particular file has problems) -- find that file in Project View, right click and see if it has "Mark as PHP" entry. If it has -- use it. the "*.hphp" is obviously wrong, how I messed that up, I don't know ? Somehow you were missing *.php one -- no clues on why it's not there.